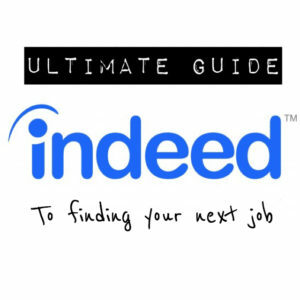 The Ultimate Guide to Finding Your Next Job With Indeed - Need a New Gig? You have finally decided to dust off that resume and start searching for that new gig, but the only problem is that you don’t know where to start! Since the recruiting landscape is always changing, and new sites continue to pop up overnight, candidates can become overwhelmed when it comes to choosing the right job search site. I have been using Indeed now for many years, and I recommend it with confidence. I can honestly say that Indeed is one of the best sites out there when it comes to looking for job postings. This article does contain affiliate links, but I am a HUGE fan of what they provide! If you aren’t familiar with Indeed, I hope you check it out after reading this article. You will be impressed! Indeed.com is a somewhat newer site, as it was launched in late 2004. The main idea behind the site is that it is a “one stop shop” for job postings. The search engine is set up with a “Google” feel, and users can simply type in their desired position and location, and it will return hundreds of results. Indeed crawls thousands of job boards, company websites, staffing firms, etc. to bring as many current postings to you in one place. Since it’s launch in 2004, Indeed has grown like crazy and passed the likes of Monster.com and others, making them the Number 1 Job Site. They now have over 200 million visitors a month, and are in 60 different countries! Aside from searching positions, they also offer other services, including the ability to post your resume, get company information, compare salaries and more. When you type in www.indeed.com, you will land on the homepage and can start searching jobs immediately. My advice is to pause for a quick minute and establish your account. This will make the application process easier, and it will save you time in the long run! To create your account click on “sign in” in the top right hand corner of the home page. 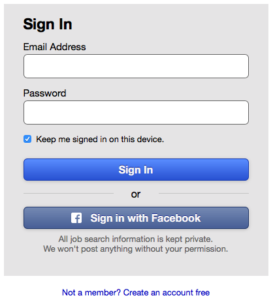 You do have the option to sign in with your Facebook account to speed up the process. If you sign up with Facebook, they will keep your information private and will not post anything without your approval. Personally, I like to keep my business/job searching accounts separate, so I suggest setting up an account just for Indeed. To do this click on “not a member? Create an account free” to get started. You will enter your email address twice, select a password, then click create account. It will then take you back to the home page, and your account has initially been set up. You should see your email address in the right hand corner. Indeed has a great section for employers, but since you are looking for a new position you don’t need to worry about that for the moment. If you are in a hiring capacity or will be, be sure to check out using Indeed for employers on our sister site The Resilient Recruiter. Uploading your resume is very easy. Just click “upload resume” and select your resume file. You will then need to complete your job preferences, including title, salary, etc. If you do not have a resume, Indeed can help make one rather quickly. Click on “build a resume” and it will walk you through a series of forms where you can input your contact information, education, work experience, etc. Once you have uploaded or built your resume, it is very important to review your privacy settings. You have the choice of either public or private. If you choose public, your information will be posted publicly, and employers can see and contact you directly. If you choose private, your information will not be posted, but it will still stay housed on Indeed to use when applying to positions. Now that your account is set up, you can start searching and using some of the other tools that Indeed provides. Job searching couldn’t be easier with Indeed. Once you are on the home page, you just need to type in what kind of job you are looking for and where. For the best results, you will want to enter in job titles, company names, or specific skills. Indeed also offers an advanced search if you are looking to receive more refined and specific results. 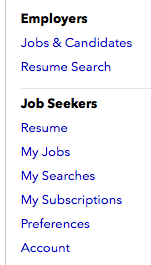 The advanced search link is located on the home page right beneath the “find jobs” button. This will give you the option to search for jobs with/without certain words, or search by type of job (part/full time), salary range, location, and age of the job posting. Now that you have searched and applied to some jobs, let’s talk about some of the other neat features that Indeed offers. These are located in the drop down menu when you click on your email address or in the main bar at the top of the page. Indeed offers a tool that allows you to monitor not only the positions that you have applied for, but also jobs that you have saved. When you apply to a position, it will automatically be added to your my jobs page. To save a job simply click on the “save this job” button on the posting. This is a tool that lets you track your job search history. It helps save time when you log back in, as you can click on the search and get fresh results. This is one of my favorite tools, as you can set up email alerts to have new jobs delivered right to your inbox. To save a search and activate email alerts, simply click on the “be the first to see new jobs” link in the right hand corner of your search results. You can then manage your alerts in the My Subscription section. This feature is one of the more recent additions by Indeed, but it can definitely come in handy during your search. Company reviews let you type in the name of an organization and get reviews from current and past employees. This gives some great insight on the company and culture of a prospective employer. They also have links for pictures, Q&A, and salaries, but it is user-generated content, so it will vary by company. The final tool that I wanted to touch on is the Salary Tool. This is the only tool that I would use with caution. At the end of the day, a prospective employer is going to pay you based on your current salary, experience, and a number of other factors for the position in which they are hiring. With that being said, this tool can still be used to give you a good idea of an average salary for certain jobs, and what companies pay. This entry was posted in Indeed, Job Boards and tagged apply, create account, find a job, indeed, resume, search jobs, upload resume. Bookmark the permalink. ← Friday Forum – Should I Send a Thank You Note After a Phone Interview?